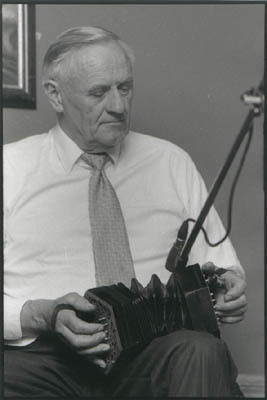 Hugh Healy, from Corofin in Co Clare. 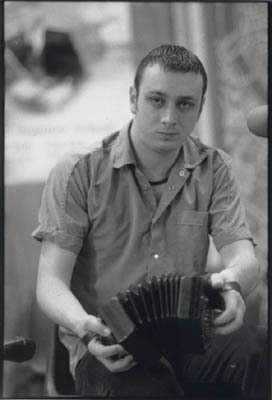 Here soundchecking on stage before the big Willie Clancy concertina concert. 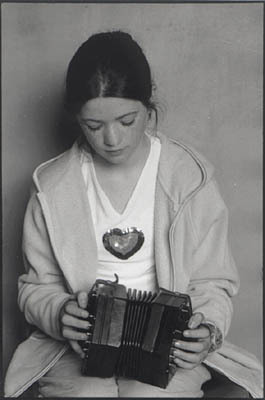 Originally from Ennis, Co Clare but now based in Dublin, Brid Meaney is one of the top players adding some lovely personal touches to the music. Great music mirrors the personality of the player. Just like her music will have many colours and moods, changing with all the little variations a traditional player may use, one moment Yvonne Griffin was introspective, inwardly focussed on the music while playing some tunes in front of her pupils, the next moment she looked at the photographer and beamed a smile that lit up the room and made your heart melt. 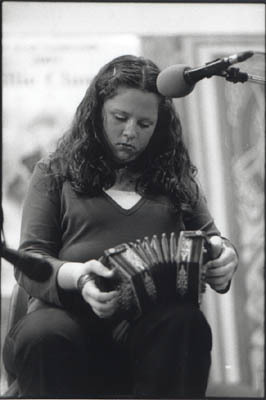 Only in her mid teens Edel Fox from Glendine in Miltown Malbay is one of the up and coming in Irish concertina music. 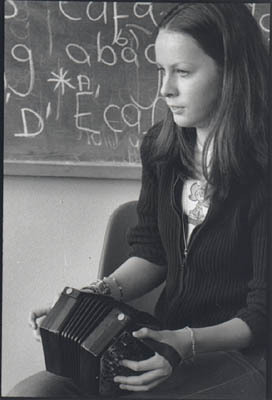 Doing well for herself in the various Fleadh competitions she also teaches a whole bunch of kids from the Miltown area. 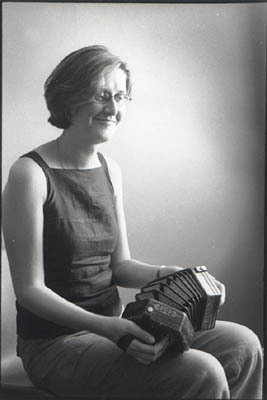 From a musical family, Michelle Mulcahy is technically skilled on the concertina. 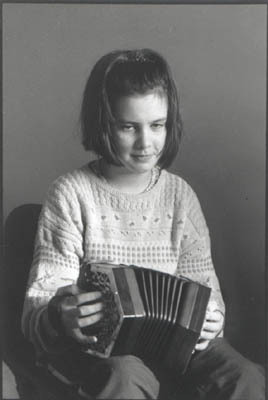 Here she is playing at the Willie concert, as Noel Hill put it 'in very difficult keys'. Not as much from a musical family as from a musical dynasty, Ita and Angela Crehan are at the heart of the tradition. 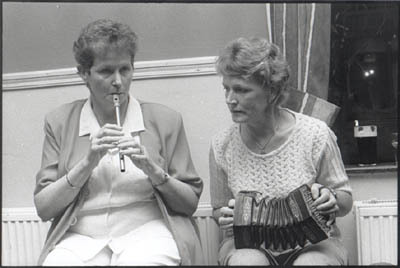 Daughters of the late Junior Crehan of Bonavilla, Ballymakea, Mullagh Co Clare, in this snapshot they are preparing for an appearance at the Tommy McCarthy concert. A few students from Brid Meaney's class during the 2001 Willie week. 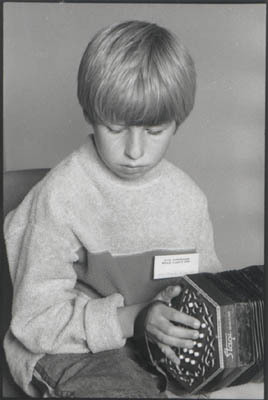 I was waiting for Brid to turn up for her class, she was late due to a traffic accident. She asked me to stay with her class while she was talking to the guards. I killed some time taking a few snaps of the practising students. These are three of them. Follow this link to Amazon.com to help support this site. Thanks! 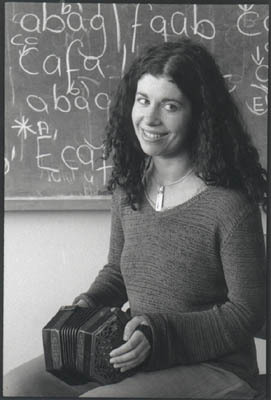 Copyright © 1996-2018 Paul Schwartz. All rights reserved. Be nice and don't copy any stuff from here without asking, okay? Thanks.